While this may seem like a novel idea, a little digging shows that it is not. Such houses exist around the world. Just don't expect to see one in my yard soon however. I suspect that my wife, the neighbors and the City of Woodbury would disapprove. 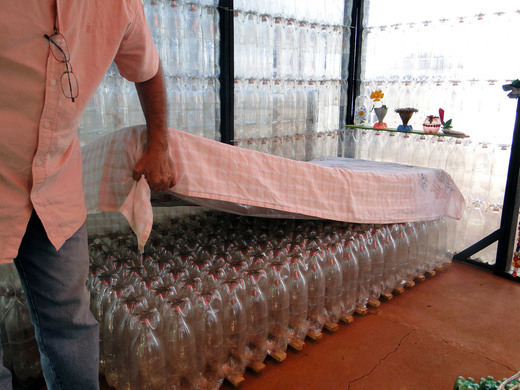 All of this demonstrates many of the strengths (literally) of water bottles. While most people focus exclusively on what only during its brief life in the hands of the consumer, I've mentioned before just some of the many requirements that a water bottle needs to meet, many of which the consumer is not directly aware of. Having a long life before it degrades can be good or bad, all depending on the application. 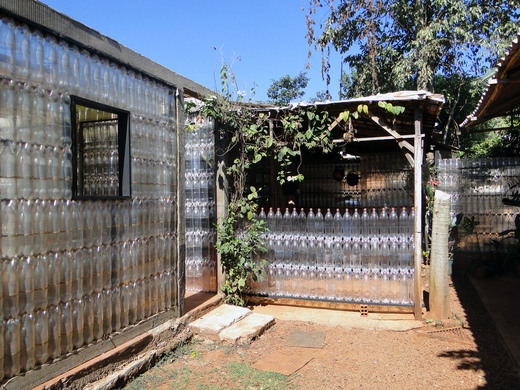 These houses are new to me, although the use of plastic water bottles in construction isn't. I wrote in the past about the use of water bottles in roofs, either as a light source or as a thatching material, all of which shows further the limitless of human creativity. I doubt that this is the last new use we will see here for such bottles. there is so many way to recycle your plastic bottle. i saw a christmas decor, it is made of plastic bottle. Holiday season is very much approaching. This is a nice ideas for decor. Thanks for sharing this. I can't believe it. Very nice. I hope to see more of it. problem is something which too few folks are speaking intelligently about. It's amazing! thanks for sharing this great information. I really like your all posts. I want to learn how to make it. Office Specialty offers a variety of pulls and fronts, shown above. Maximize space with the 10.5" drawer height, shown with the 9900 series pull detail. Fits a standard hanging file and works great for tight spaces. The tour like https://www.imanali.in/manali-tour-package-kalka give you the chance to have the joy of the different types of food. This will make you able to have the taste of the special food items of every place . This is the best chance for the people who are die hard fan of the food. This is like a golden chance for them. Located in Lake Worth, Florida, J&M Contractors of South Florida Inc. Roofing Division are your expert roofing contractors with a hybrid of experience and knowledge in the roofing industry, our team members have been serving Palm Beach County, Broward County and Martin County for over 30 Years.